Heat oven to 375°F. Spray 9-inch pie plate with cooking spray. Add vegetables, chicken and soup and stir to combine. Bake uncovered 25 to 30 minutes or until crust is golden brown. If you’ve got leftover cooked vegetables, use them instead of the frozen vegetables. You can even plan for that if you have this pot pie on your menu rotation. Season up the base veggie mixture with your favorite blend of dried herbs—sage, basil, oregano, or dill will bump up the flavor quotient. 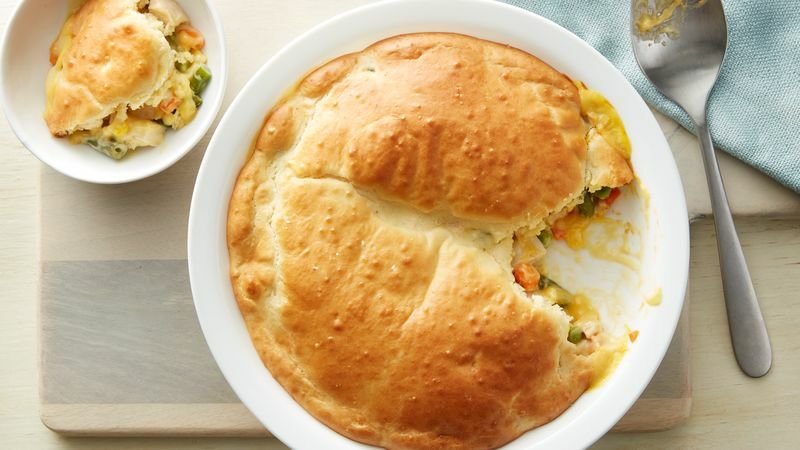 A chicken pot pie recipe was first featured in the Betty Crocker Cookbook way back in 1950, and it’s remained a favorite of home cooks ever since. We’ve taken the classic recipe and added several time-saving spins that will streamline your prep time to a speedy 15 minutes. Just pull some frozen mixed vegetables from the freezer and a can of soup and box of Original Bisquick™ mix from the pantry, and you’re on your way to a hearty, satisfying dinner that will taste like you spent all day in the kitchen. Once you’ve tried this recipe, there are so many fresh new twists you can try in Betty’s best chicken pot pie collection which includes photos, tips and reviews, as well as recipes for time-tested favorites and modern new twists.